How do you say thank you for the birthday wishes? If someone sends you a birthday thank you message through a birthday card, note, text, or on social media, proper etiquette calls that you respond by thanking them for the message. Whether it is for your friends, colleagues, girlfriend, boyfriend, parents or anyone else – use this post to ideate on how you will word your own quote that reeks gratitude. We have prepared for you 12 ways to say thanks for birthday wishes and to show your feelings in best possible way. 1. Thank you from both of us for the baby shower gift and lovely wishes of congratulations with your generous heart. We sincerely appreciate your thoughtfulness and blessings. 2. 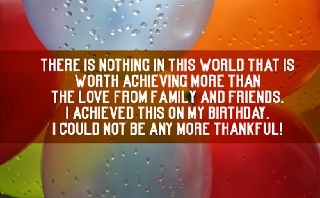 I just wanted to thank everyone who sent me a birthday message and let you know that I truly appreciate it. I&apos;m so luck to have such a wonderful group of friends and family that can share in my special day. 3. Your birthday wish made my day a little bit more special. Thanks. 4. If my life was a balance sheet, the greetings you sent have just become one of the biggest assets which will drive the profits of happiness and smiles for many years to come. Thank you. 5. Friends, thank you so much for the kind words on my birthday! I really appreciate the well wishes as I slowly climb over the hill. Can&apos;t wait to party with you ladies soon! Kisses and hugs! 6. Please give me the opportunity to thank you from my heart, You guided me along for a perfect start, Without you, everything was impossible to achieve, Thanks a lot! 7. Had you not sent a text on my birthday unfailingly, I would have felt lonely even in the midst of friends and family. Thank you so much. 8. I just wanted to thank everyone who sent me a birthday message and let you know that I truly appreciate it. I&apos;m so luck to have such a wonderful group of friends and family that can share in my special day. 9. Thanks for all the wonderful gifts you sent, With you, I really do not need to pretend, You always make me feel so good, Cheers to our friendship, ‘touchwood’ Thanks a lot my friend! 10. Just like how food remains tasteless without salt, my birthday celebrations would have been incomplete without your wishes. Thanks for being the SALT in my life. 11. The birthday message you sent me is going to make me feel special today and through out the rest of the year. 12. You guys made my birthday remarkable with so much fun, I really cannot thank you enough, To start with thanks a ton!